The Middle Tennessee Regional meeting will be held June 5th at Middle Tennessee State University. See the below flyer for details on this event. To reserve your spot email Andy Grubbs at agrubbs@hughston.com. The West Regional Meeting will be held June 4th in Collierville, Tennessee. See the attached flyer for details about this event. In conjunction with TATS, the University of Tennessee is hosting a free CEU event. Space is limited so be sure to sign up! Tennessee Athletic Trainers, let’s get it in gear! North Carolina has officially challenged us to a competition that will run through the month of March to help spread awareness of the importance of athletic trainers as health care professionals. Incentive: LOSING state sponsors a granola bar for snack at the WINNING state’s next annual meeting! The TATS Governmental Affairs Committee would like to announce our upcoming Capitol Hill Day. We would like for athletic trainers from throughout the state of Tennessee to join us in Nashville to meet with your State Legislators and discuss topics important to the athletic training profession in Tennessee. This year’s TATS Capitol Hill Day will be held on Wednesday, March 6th, 2019. In order to best arrange meetings with legislators, we would like all of those interested in joining us to sign-up via the form below. If you are unable to sign-up but happen to be available to join us on March 6th, please know that all Tennessee ATs are welcomed. Sign-up today!!!! More details will follow soon. Thank you! We will announce more details as we get closer to March 6th. The theme for March 2019 is “AT’s are Health Care”. This theme “provides an opportunity to shed light on the many contributions athletic trainers have made, and continue to make, in areas such as research, innovation and patient care, and contributions that cross a variety of settings – from sports to the military – throughout the U.S. and abroad”(2). NATA is hosting a social media contest and is looking for pictures of this years poster displayed in training rooms or your workspace. Be sure to tag @NATA1950 and @tnata (so we can repost!) and use the hashtags #NATM2019 and #ATsAreHealthCare. To read more about this years NATM 2019 and national initiatives or to get your resources, read the full article below. The 2019 TATS Annual Meeting & Clinical Symposium will be this January 19th & 20th at Trevecca Nazarene University in Nashville, TN. We are excited to be offering up to 12.5 CEUs for our annual educational event. Make plans to attend this exciting event at our newest venue. The 2019 TATS Annual Meeting & Clinical Symposium will be this January 19th & 20th at Trevecca Nazarene University in Nashville, TN. We are excited to be offering up to 10.5 CEUs for our annual educational event. Make plans to attend this exciting event at our newest venue. 2019 TATS Annual Meeting - Registration Now Open!!! Join TATS in promoting the vital role of athletic trainers in school athletics by requesting your TN AT Helmet Decals. These labs will have the same content and each session is only available to the first 20 attendees that register. Annual Meeting Registration Now Open!!! The TATS Annual Meeting & Clinical Symposium is the premier event to kick-start the new year for athletic trainers in Tennessee. Our two-day conference boasts important educational opportunities (including evidence based practice CEUs), the society business meeting, career networking for professionals both young and old, as well as social outings hosted by the Young Professionals Committee. The meeting will again be held on January 16th & 17th, 2016 at the GSO Auditorium on the campus of Saint Thomas Midtown Hospital in Nashville, TN. The cost of the event is $99.00 for Early Registration. By attending the meeting you will be able to earn up to 11 CEU hours, with EBP approval pending on 4.5 of those hours. Early registration ends on January 8th, so be sure to register prior to that day to avoid the increased fees for late registration. Registration will also be available at the door on the day of the event, but at the late registration fee cost of $110.00. If you have any questions regarding the event, feel free to reach out to TATS at tats.communications@gmail.com. We sincerely hope you can attend and look forward to seeing so many great healthcare professionals in January. Need EBP CEUs? Here's another opportunity! 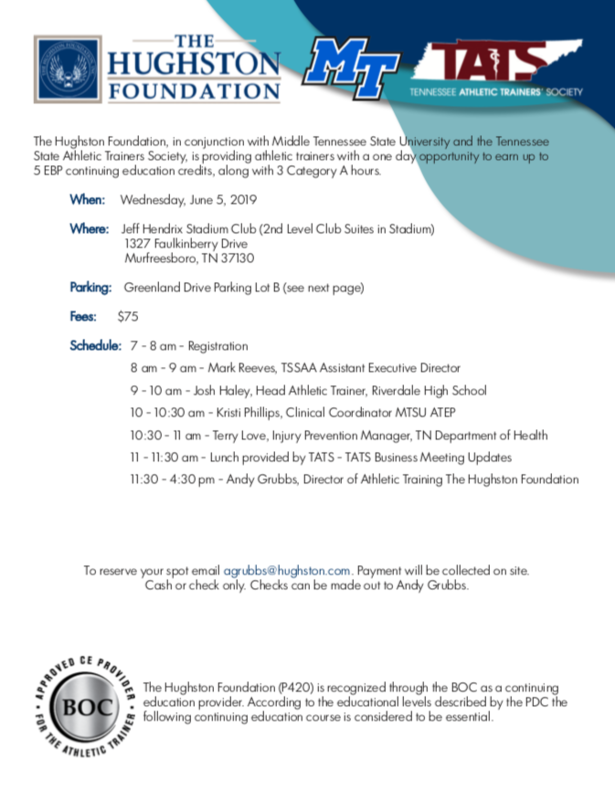 The Hughston Foundation, in conjunction with Rutherford County Schools is providing athletic trainers with a one day opportunity to earn up to 10 EBP continuing education credits. The event will be held on Tuesday, July 14th, 2015 at Central Magnet School. To find out more details click here. The Program for Injury Prevention in Youth Sports at Vanderbilt is hosting the Youth Sports Safety Conference & Gala on July 16th & 17th, 2015. Athletic trainers throughout the state of Tennessee are invited to attend this educational event. Details can be found on the flier below and also at the PIPYS website.